A friend of mine recently asked me for design ideas and construction assistance for a full-sized that bar he is planning for his basement. Although I am excited to be helping conceive and construct this grand bar, I also recognize that some spaces and budgets may not fit a traditional bar. 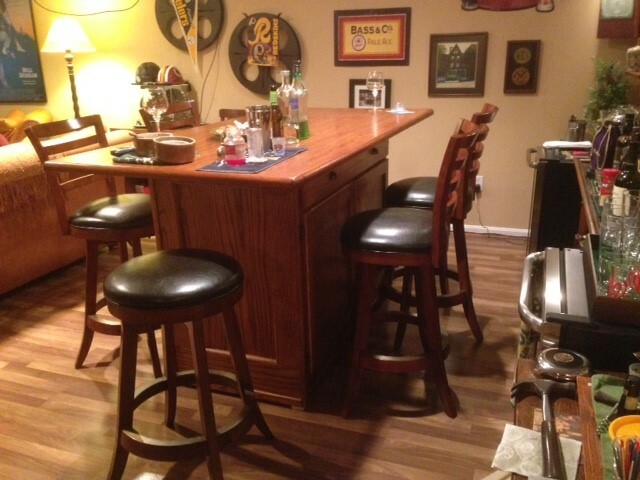 In this quick note, I wanted to share some of the design ideas I used for my basement bar. 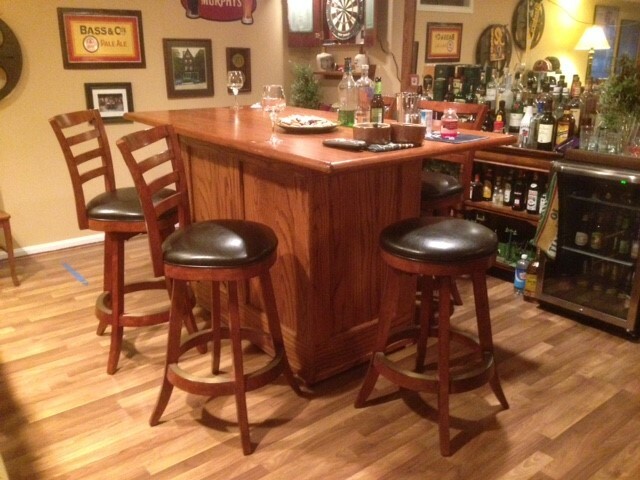 I had the space to construct a full sized traditional bar, but considered how it would be used and decided that I would more likely benefit from a bar that also doubles has a high table that we could eat meals while watching a movie or the big game. In my case I chose a 4-sided bar so that I could sit folks on all sides. The top is from an old executive’s desk that I purchased for a couple of bucks. I also put mine on wheels so I could move it if desired, perhaps into the corner to facilitate a more traditional bar deployment. As expected, I never have moved it. Shown under the mirror is a re-purposed a 60”wide x 18”deep x 34” high sideboard / buffet table with a full length liquor riser to make bottle access easier and an 8’ diagonal mirror framed with 1×4” oak to visually tie the pieces together. The base cabinet is 3 sides of 3/4” oak plywood, simply joined on the edges with biscuits and glue. Although a single sheet of plywood could be used for the front, instead I cut two separate pieces to size and joined them to keep the grain of the wood running vertically. To create a paneled effect, I then added ¾” oak cut to 4” for the vertical pieces and 5” for the top pieces. The frames were glued and nailed, then trimmed with ¾” quarter round. Additional trim was added to the base to reduce the distance to the floor while still allowing the wheels to operate properly. The base cabinet dimensions are approximately 24” deep by 48” long by 40” high (add 2” for the bar top). With a careful cut plan, I was able to construct the entire cabinet box from two sheets of plywood. 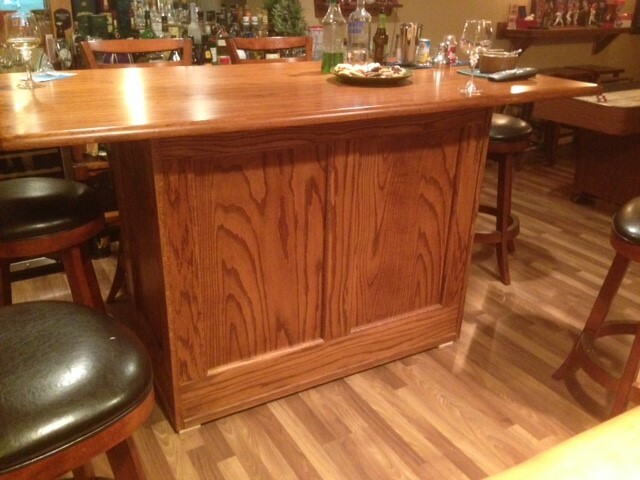 The back side of the bar has a solid oak face frame constructed from 1×2’s. It has two cabinet doors, a full shelf on the inside, and a full length drawer. The cabinet doors are shaker style flat panels with simple frames and a ¼” oak plywood panel. For over-flow sitting we added a few extra bar stools and a 4’ x 12” deep wall bar that provides a place to set drinks and plates. For more information, dimensions, and construction details, just send me a note.